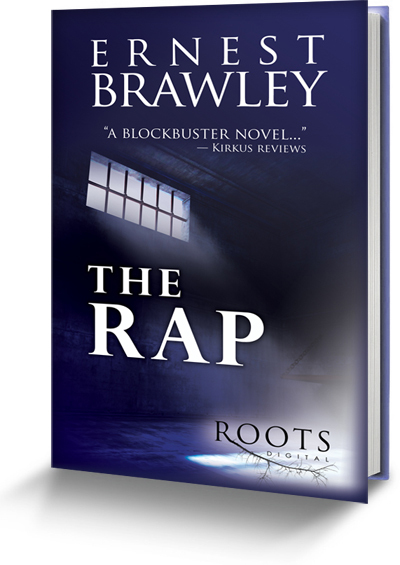 The roiling action of Ernest Brawley’s The Rap takes place in and around a penitentiary much like San Quentin. The time is the early 70s, when George Jackson, Angela Davis and others were agitating for prison reform, and the authorities were doing everything they could do to thwart them. A young, sympathetic guard, Arvin Weed, attends night classes at a local college in pursuit of a dream to break away from his worst nightmare: working at the prison forever, like his father. But his reputation as a Vietnam vet rifle marksman draws him unwittingly into a conspiracy to murder revolutionary, black militant leader, William Galliot, who’s just been sent to prison. Arvin’s evil cousin, Wasco Weed, also a recent arrival to the prison, fancies himself a criminal genius, and has, in fact, been directly tapped by conservative political eminences to assassinate Galliot, the revolutionary. Wasco shrewdly manipulates everyone in his orbit, including his voluptuous wife, Moke, an almost supernatural creature given to midnight swims in the ocean and driven by a ferocious craving for money and power; Fast-Walking Miniver, a young guard and the warden’s scapegrace son; Big Arv, Arvin’s loutish father; Lobo Miniver, the urbane and opportunistic warden; and even Wasco’s own mother, Evie, the bawdy proprietress of a whorehouse. Moving from the tragic to the comic, the obscene to the exalted, the real to the surreal, The Rap is the ultimate American saga.